Buying - We are always buying anything of value and are paying premium prices for high quality items. We want your Hand Blown Glass, Vintage Guitars, Pocket Watches, Broken Jewelry, Electronics and much more! 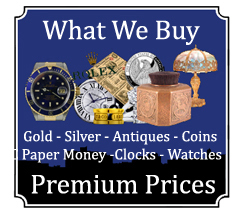 We like rare valuable and unusual items so come in or call us today to get the cash you need. 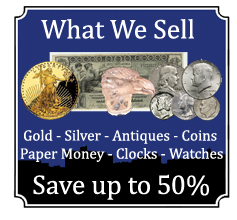 Selling - We are always selling Fine Gold Jewelry, Diamonds, Bullion, Coins, Watches, Electronics, Antiques and Art. Our prices are very reasonable and will save you money. We also offer a 120 day layaway with 20% down. Our inventory changes daily and we carry a lot of interesting and unique item(s). 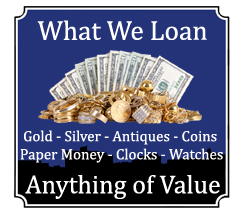 Pawn Loans - We offer collateral pawn loans for the lowest rates in the state. We lend you the money you need without parting with your item(s). There is no credit check and we do not report loan activity to your credit report. Everyone is approved with a collateral pawn loan and we offer rates as low as 15%. Appraisals - We have been appraising items of value for close to 20 years and have the reputation of accurately evaluating any item. Appraisal prices will depend on the value of the item and time spent researching. Just bring the item(s) in and we will be able to give you an estimate of appraisal cost. Jewelry Repair - We offer full service jewelry repair to keep your precious jewelry looking stunning. Our jeweler has over 20 years in the business with exceptional work at the best prices, GUARANTEED! Watch Repair - We offer a full range of watch repair services to get your favorite timepiece working. Whether it’s a wristwatch or pocket watch, Timex to Rolex we have expert craftsmen ready to service your needs.